M'BOLHI: Everyone was fit and ready to play and Ramadan is not to be blamed. PORTO ALEGRE: Algeria goalkeeper Rais M'Bolhi insists his side's 2-1 extra-time defeat to Germany was not down to his team-mates' observance of Ramadan as the Desert Foxes bowed out of the World Cup. M'Bolhi's man-of-the-match display between the sticks repeatedly thwarted the Germans in normal time before Andre Schuerrle and Mesut Ozil scored extra-time goals to decide the last 16 clash. Algeria grabbed a deserved consolation in Porto Alegre right before the final whistle to offer brief hope through replacement Abdelmoumene Djabou. 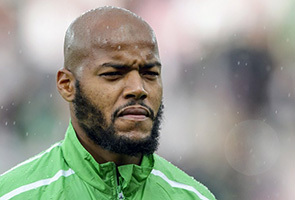 Having counter-attacked the Germans with fierce determination during the goalless 90 minutes, Algeria tired in extra-time, but M'Bolhi says Ramadan was not to blame. Most of the team are reported to be observing the Muslim month of fasting, which started on Saturday, and would have only been able to drink water late in the first-half. "No, I don't think (it was a factor), we were ready to play for as long as we need to, nobody believed we were able to put in a performance like that," insisted M'Bolhi. "It didn't come down to physicality, everyone was fit and ready to play, we just conceded two late goals. "This is a personal question, it's between us and God, I don't think I have to answer you, Ramadan is a personal thing." Much of the pre-match talk had been of Algerian revenge more than three decades after the 'Shame of Gijon' when Germany's mutually beneficial 1-0 win over Austria sent Algeria home from the 1982 World Cup. But Germany progress to the last eight to face France at the expense of the north Africans, who had reached the last 16 of a World Cup for the first time. "We're very disappointed, because we felt there was something to have been had from this match," said M'Bolhi. "We're part of Algerian football history, no other team went so far before and we showed we can play on an equal footing at the highest level. "We really want to build on this and push on." Algeria coach Vahid Halilhodzic failed to attend the post-match press conference amidst rumours he will step down after the World Cup. "There are rumours going around, but we need to thank him for all he has done," said veteran defender Madjid Bouguerra. "He took on the team when they were very low and has given us confidence, we all kissed him at the end and if he does leave, he needs to be rewarded. "Yes, we're disappointed, but we're proud of what we achieved at this World Cup."